Are you getting frustrated with seeing small dark spots in your images that seem to show up in every image? 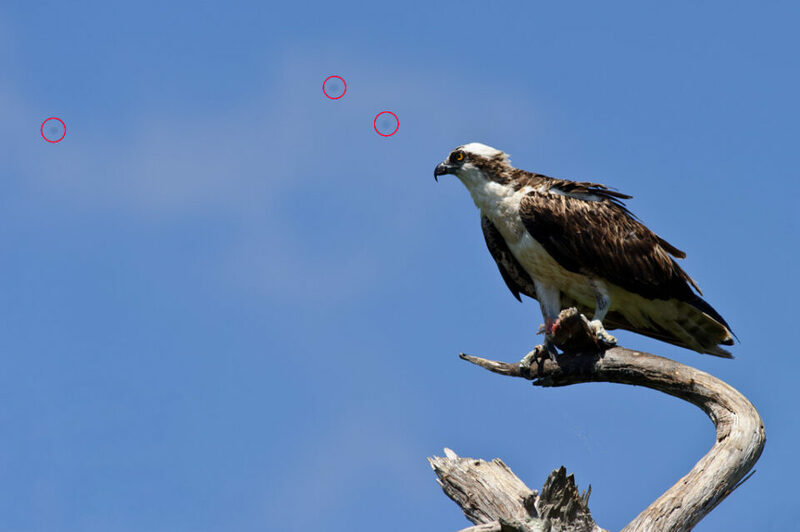 If you see them consistently in the same location (the size and darkness of the spots can vary depending on aperture), you are most likely dealing with dust particles on your camera’s sensor. In this short article, I will show you a quick and easy way to identify sensor dust when shooting outdoors. If you own a DSLR or mirrorless interchangeable lens camera, you will at some point have to deal with sensor dust, whether you like it or not. Dust is a normal fact of life and it is all around us, even at our homes that we try to keep clean at all times. The dust lands on both the lens and the camera body, and, due to the “breathing” mechanism of the lens while zooming in/out and focusing, the small dust particles end up getting sucked into the camera body. All lenses breathe one way or another or else the internal elements would not be able to move for autofocus and zoom functions. If you use more than one lens, the dust might be able to get into the camera body during the process of changing lenses. The camera mirror – when dust ends up being on the camera mirror, you will not see it in your images, but you will see dust particles when you look through the viewfinder. This one is just annoying and it can be easily cleaned either with a small brush or a blower like Giotto’s Rocket Blower. The lens exterior, front and/or its back element – while very small dust particles will not affect image quality, the larger ones and dirt/grease will decrease contrast and might even possibly degrade image quality. Always make sure that both the front and the rear elements are clean and dust/dirt free. The camera sensor – the worst case scenario, because the dust particles will show up in every image, especially when stopped down to small apertures like f/10. Cleaning the camera sensor is not easy and the process requires special tools that need to be used with extreme care. The first one is not a big deal – if you see some dust inside the viewfinder but you do not see it in your images, do not worry about it too much and only clean the mirror if it is too annoying for you. The second and third are the ones that can spoil your images and have a negative effect on affect image quality. Let’s talk about lens dirt first. Note the white area inside the circle – that’s how oil/grease would affect the image. In many cases, you might see a color shift in addition to decreased contrast. See that large dark spot on the top of the frame? When I took the shot and looked at the viewfinder, I immediately knew that the rear element of the lens had a large dust spec on it, because neither the dust on the front of the lens, nor on the camera sensor looks anything like the above. I changed lenses in a very dusty and windy area (not a good thing to do) and something large ended up landing on the rear lens element before I mounted it on the camera. The result is a large dark circle in the frame! The size and visibility of the dust particles will change as you change lens aperture. At maximum apertures on fast lenses such as Nikon 50mm f/1.4G, you might not even notice the dust particles in your images, which does not mean that they are not there. They will only be visible at smaller apertures such as f/4.0-f/5.6 and higher. As you increase aperture to a larger number, the dust will appear darker and more pronounced and the size of it will also get a little smaller. Dust particles will always appear in the same spots. Sensor dust can never be seen through the viewfinder, it only shows up in images. Even then, you might need to zoom in to 100% to see it. 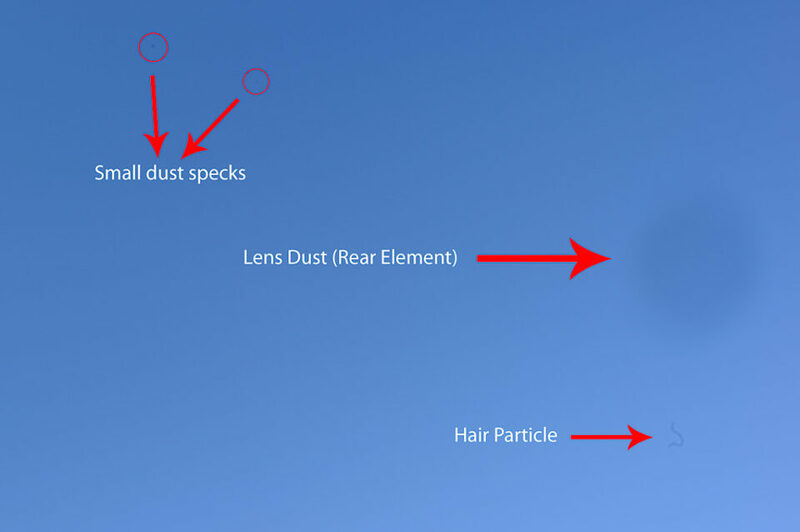 Larger dust particles and hair can be visible right away without having to zoom in (see example image below). Those three sensor dust specks ended up being on my sensor after a long day of driving through a very dusty area. As you can see, the dots are quite obvious and are much smaller than the earlier example of dust on the rear lens element. I used a small aperture of f/10 for this shot to get the bird in perfect focus, so the dust specks showed up right away. Set your camera on Aperture Priority Mode. Set your metering mode to Matrix/Evaluative Metering. Set your camera ISO to the lowest number such as ISO 100 or 200. Turn off autofocus and set your lens on manual focus. Set your aperture to the largest number available for your lens by rotating the camera dial. For example, the minimum aperture on the Nikon 50mm f/1.4G is f/16, so if I were shooting with this lens, I would set my aperture to f/16. If you are outside, point your camera up at the clear blue sky and take a picture. If you are indoors, find plain white paper, zoom in all the way so that the paper fits the whole frame, then make sure that the lens is completely out of focus and take a picture. If you are in front of a computer, open up a text editor such as Notepad, maximize it to the screen and then get as close to the monitor as possible so that only the white color is visible in the frame. Make sure that your focus is way off (completely out of focus) – that way only dust particles will be visible. Zoom in on the image (rear camera LCD), scroll from left to right and top to bottom all over the image and see if you can find any dark spots. If you cannot see any, your sensor is clean. If you see dark spots like in the above example, then your sensor has dust on it. The large dark circle is dust on the rear element of the lens, while the dots and hair are both on the camera sensor. As you can probably tell, I had to do some cleaning of the sensor after I saw the above. I obviously did not do it on location, but in a dust-free environment as soon as I got back home. Another useful article…thanks for sharing it with us! You are most welcome Gyula! Pasquier, yes, except I have not had time lately to write a guide on cleaning sensors yet ;-) Too much gear to test, too little time! You need light to hit on the sensor to be able to see the different colors, no light means black. You are already eliminating the possible blacks/shades by picking a nice plain, lighter, color background. So the last piece of the puzzle is a thin beam of light (minimum aperture) that can illuminate the sensor without being too bright/strong so that the glare could hide the “dark” specks. If I remember correctly the larger the aperture more light gets in, the harder it is to control because it will more easily bounce in all the lens surfaces. Aaron, sorry for a late response! 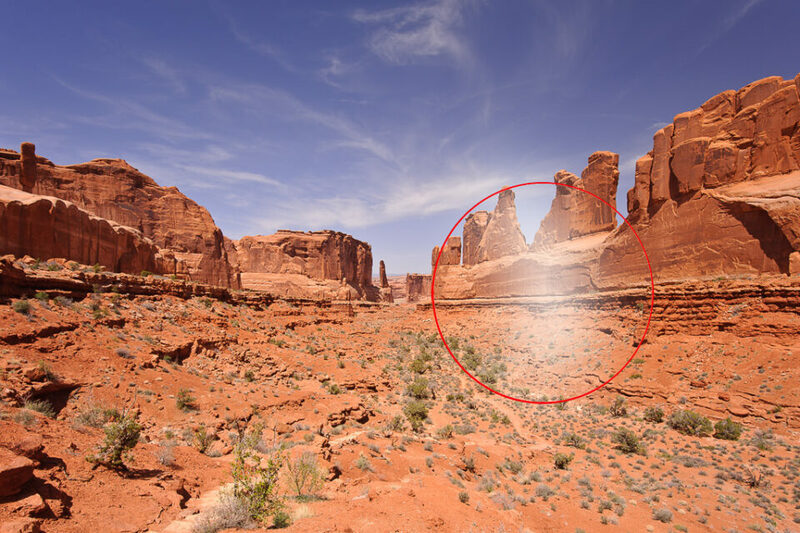 The primary reason is the shape and direction of light – when you use a large aperture, the light spreads from the aperture all over the place, hitting dust particles on the sensor filter from different angles. When you use a small aperture, the light is perpendicular to the sensor and the dust spec is hit from a much narrower angle, which then exposes dust particles more by casting hard shadows vs soft. Cold you tell me if the dot on the attached photo is Dust, stain or what do you think it is?Please tell me where i can send the photo to. IT IS A VER Y INTERESTING DOT ON THE PHOTO. excellent.. need to check out mine today itself! Nice article.Waiting for your “how to clean camera lenses”, i will defiinitely stay tune…. Mymy, sorry, but I have not had time to write the article yet. It is still in my “to-do” list. I have got fungi on my 18-55 nikon kit lens.. Is ther any way I can clean it by myself ? Think its on the outer side of the lens. Vivek, when you say that it is on the outer side of the lens, can you be more specific? Is it just on the front element or can you actually see it inside? If it is the latter, then you will need to send your lens to Nikon for repair. If the spot remains in both the viewfinder and in live view, it is most like the lens. The spot could be somewhere other than the front element. Have you tried zooming at different focal lengths , the optics might dilute the anomaly at different positions of the lens elements. Try another lens if you can, as well. That’s good, but it doesn’t explain why the spot was visible in the viewfinder as well. I am currently in Shanghai and bought the camera from here. I gave it to the service center here. I asked them whether it was a sensor dust or something else. The service engineer there speaks only little English and he did not understand my question properly. After making certain desperate attempts in making him understand my question , I retired :) Anyway service was good and fine, and it was a 5 mins job. did it cost you anything? Because I just inquired and they told me it would cost me 800 and odd :P They said they might want to replace it! Scary! Hi! First of all thank you very much for these quite understable explanations. I was suspicious about dust on my camera sensor because of some white spots on some phtos, so I followed the rules and did the test with the withe paper twice, one for each lens. I found 14 (fourteen!!) dust spots and also fine shades here and there. I also noticed a little spot when I look through the viewfinder, that spot is not on any lens because I looked through it without the lens and the small spot is there near a focal point mark. I bought my camera for about 5 months and I am very careful with it, also when changing lenses which I don’t do too often. What do you suggest, I mean, what is your advice? I’m a bit afraid of touching the sensor as well I don’t think I can afford take it to a technician. Thank you very much! I’m thinking of buying a used lens. It says that there’s quite a bit of dust in the second element. What it that mean? Does it affect the quality of the photo? I have been looking all over the internet and I can’t find anything about it! Unless there’s a different name for it! Also, would a used lens affect my new camera body? I had always used new lens, so maybe it’s a silly question but the dust ( which I don’t know where actually is) could affect my camera? Thanks for your help! I found your posts very very helpful! Hi Nasim, I wonder if you could help me. I can see a little spot of dust through the viewfinder of my D5000. I believed it was in the lens but I changed it and nothing changed. It is not in the sensor since it is not seen on my pictures. Is it on the mirror sistem? I tried to blow some air using an AA1910 Giotto’s rocket air blower but the dust spot remains there. What can I do to remove it? Despite not spoiling my pictures it is bothering me. Eduardo, the dust is either on the mirror, or right above the mirror on glass surface. Try to use your blower on both and hopefully it will be removed. a week ago i bought the point and shoot nikon s9100 with 18x zoom. i found a rear element dust on my photos when i zoom. the lens is not removable to clean it by myself . do you think that a technical could open it and clean it? Dear sir, I have been following different authors from different parts of the globe, who are really really very much talented in Photography profession. But when it comes to you I can say that if anything top award like Novel prize is there in photography, it will go to you. You are the perfect person and I salute your knowledge. The most humble part is your attitude to share your knowledge. I think no other author shares this much of knowledge and experience you are sharing. understand your articles. I hope one day I will be able to capture a good photo which will truly satisfy me. You are an encyclopedia of photography. I just tried to clean my D40 with this method and unfortunately, there are still significant dust particles after 4 attempts. I am nervous to do my D700, but I do see a lot of dust on its sensor as well (using the testing method). I may just leave it there! Молодец, спасибо. Мы с женой многому у тебя научились. While checking your test photo in a computer screen,. please clean and double check the dust in your computer moniter screen. you may be fooled by the dust which is already there in your computer screen..
Oh my god! I am seeing so many spots on my sensor.. In the first attempt, I didnt believe there could be so many. But when 2nd and 3rd attempts on different white surfaces also showed same spots at same places, I had to believe it.. :( Thanks for opening my eyes! This is exactly what has happened in my case. Thanks for the help. I would like to know where your next article is. The one where you said you will be illustrating about cleaning the sensor, mirror etc. Wow! I learned so much from your website. I got a nikon d3200 last december 2012 and after using it in a dusty environment I found my sensor full of dust. I bought an Eclipse sensor swab and cleaner, sad to say its the only cleaner here in the Philippines. I cleaned it the way you taught in your video. And my sensor’s already clean. I just want to know how do I know that my sensor was damaged by using the Eclipse cleaner? Thanks! I can see just how dirty my sensor is. Great website for educating photographers of all walks. This is a wonderful article. I’m dealing with heavy dust issues on my sensor (and self-cleaning has appeared to make it worse) that need to be taken care of. Is “Dust off reference” effect the resolution of the shot? I hope you can help me please about the resolution question? very nice article. found it extremely useful. I clicked pictures of my laptop screen after opening NOTEPAD, opened the pictures in PICASA, clicked on I AM LUCKY for better contrast. It is better to click two pictures and toggle between the two. The dust on the sensor looks sharp and is stationary. Also click at higher apertures( like f8,f3.5,f1.8) and observe that the spots just blur and fade away, hence, we do not observe these at the apertures that we normally shoot at. This article was so useful, thank you ever so much! I had a spot of dust on the rear element of my telephoto lens, and in 2 seconds using google I found your image explaining what was causing the problem with my image. I will certainly bookmark it for future use. I think I can spot 3 specks of dust that match those for sensors using your method (I used a white wall lit by a slightly yellowish light). 2 are faint and blurry, rather like those in your example. 1 is much darker, and more distinct, does this mean that it is a darker spot of dust? I’m hoping it’s not any damage. Looking forward to your cleaning article, thanks! Hi Nasim, thanks for the post. I have been wondering what is wrong with my pictures. I have an M8 which I bought a few months ago and then suddenly I started seeing spots in the pictures. Trouble is it wasn’t in all pictures and not all lenses. Reading this article it looks to be on the sensor, so I’ll check out your cleaning articles… cheers! Did you ever write the article on the sensor cleaning? Hello Sir! thank you for this post. I’m a very “beginner level”, hobbyist and I find your posts very helpful and amateur friendly. I’m mean I could understand it easier than other sites. This sensor dust is my case now. I bought my Nikon D610 second hand in Japan but I didn’t notice the dust at first since I usually work within f1.8-f3.5 range. But when I came back to the Philippines and did some landscapes, it became more evident. still looking for a reliable service center here in Manila. 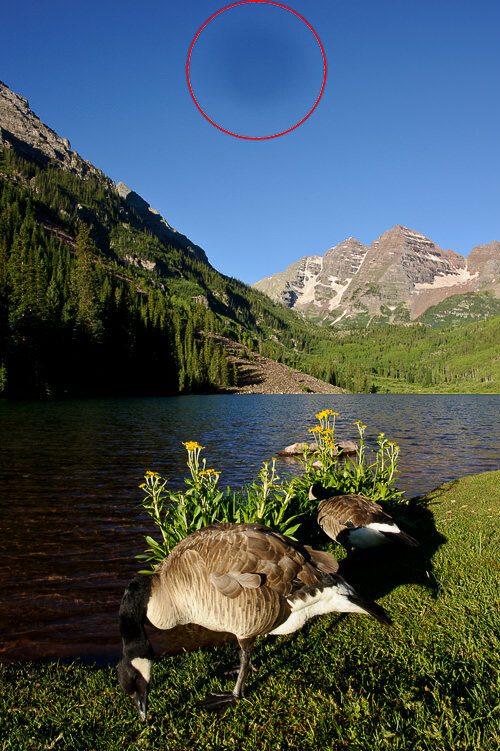 Oops, looks like the Beaver hut is gone at Maroon Bells. GREAT article with helpful examples. Hi there is it possible i can have permission to use these images to make a video on youtube ? I am getting a particular part as distorted. does this need repair or I can fix it at my own? I have an iPhone 5 that had a broken screen which allowed dust to get inside. And this caused the front camera to become foggy. So I replaced the screen which includes a new selfie camera but then noticed a dust speck on the main camera images that enlarges with zoom. I tried to clean the lens with an air can and it seems to me that I’ve made it slightly bigger. After reading your article I pointed the camera right next to a white wall, out of focus, and the speck is still there in focus. I’m pretty sure that this dust was not there before my interventions. I could replace the camera (only 12€) but it’s a 1 hour job by disassembling just about the entire phone. If I blew dust onto the sensor can I remove it by blowing more air ? Tnx for you useful advice and demonstrating the gel lens cleaner. I tried what you suggested to take a test shot of my sensor at f/36 in both my bodies using different lenses. My Canon 7DMII (which I had for a couple of years doesn’t have a single spot) which made me proud but I do not use it very often and usually stays with one lens attached (the 100-400 II) most of the time and my 6D which I had for 4 years and when I use I change lenses all the time only had a couple of tiny spots which I’m also very happy about (I thought it would be far worst) and under normal shooting I never noticed them. When I visually inspect my 6D sensor, even with a magnifying glass and a head lamp I cannot identify these two tiny spots on my sensor. My question when I look at the photo with the spots at the LCD back of my camera the spots appear to be on the left hand side towards the edge and half way through in terms of height. When I visually inspect my sensor at the front should I expect to find these spots at the same coordinates or is the sensor their reverse or upside down or something along these lines. So for example what I see in the picture at the back as left when I look at the sensor at the front is right or left? Ditto for up down. When the dust spec is in the top right corner on the photo, which corner of the matrix is that when looking straight at it? Just want to know where to focus my little blower. I made a choice on used Canon 6D and going to test it carefully. After short researches I found your articles and will be very useful. Thanks and I’ll be following ! Thankyou for the very helpful tutorial!! I was frustrated, but this helped me identify and clean dust off my camera’s imager.